What is the one most important thing that makes a sewing machine the best of all? Well, all sewers, beginners or professionals, look for a sewing machine that is packed with features. It’ll be an understatement to say that a sewing machine is merely competitive. The market is filled with competitive products which give sewers a tough time in choosing a product. To make it easy, we’ve picked a sewing machine manufactured by Brother. Brother is a renowned manufacturer with some remarkable products on the market. In this article, we’ll take a detailed look at the Brother computerized sewing machine HC1850. If we only look at Brother, it has produced a wide range of sewing machines. Brother’s products have a high standard and are famous among many beginner and professional sewers. 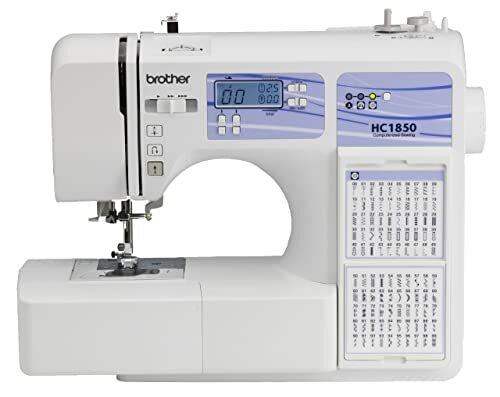 The HC1850 is another versatile sewing and quilting machine by Brother. It is a 130-stitch, multi-purpose, and a flexible computerized sewing machine. Let’s see if the product matches the quality standards set by Brother and how it fares against other competitive products. Can this model be better than many other higher-end products in the market? Let’s find out! We cannot deny the importance of the look and the appearance of a sewing machine. It has a great impact on our overall sewing experience. A tacky or unattractive machine will ruin the look of your stitching collection. And if you are a professional, an unattractive machine can also put off your clients. The brother HC1850, fortunately, has a sophisticated and clean appearance. It has a stitch chart on the front panel. You can use the stitch chart for quick reference and convenience. There is also a small backlit LCD screen in the front. The LCD screen is used to display information regarding the stitch selection. You can easily select the stitch type using the push buttons and the information displayed on the LCD. With the help of easy buttons and controls, the machine allows you a lot of control and adjustments on your stitching experience. A stitch speed slider is right there in the front for easy and quick access. Moreover, the work area also has a lamp that you can use to light up the area when you need to. The working space originally is not so big. But the machine does come with an extendable table that you can attach or detach anytime you need. This means convenience, customization, and lots of space, all in one! 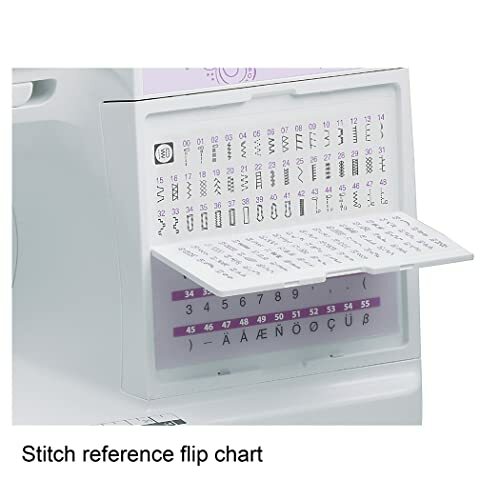 The stitch chart on the front panel can be flipped to see the remaining stitch types. Moving on from just the external features of the machine, there are many versatile and powerful functions the machine has to offer. It provides a positive user experience with its customizability and flexibility. 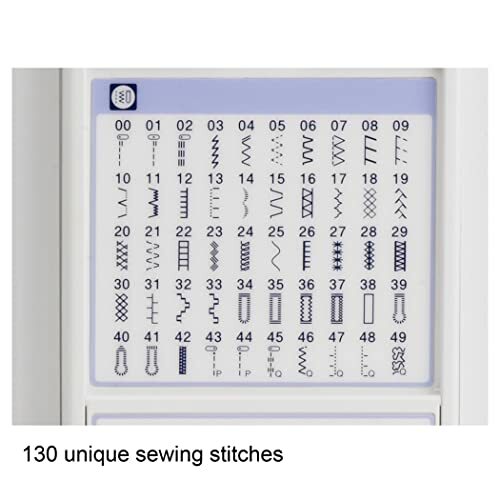 The machine allows you to choose from a variety of 130 built-in stitches! This is a great number of stitches, especially if you are a beginner. It also has 8 one-step built-in buttonhole styles. So, you can stitch professional and designer level clothes and use all your creativity freely. The machine stitches at a speed of 850 stitches per minute. This is a great stitching speed and fulfills the purpose of stitching faster and better. In fact, you get quality and quantity both in one machine! For basic or beginner level monogramming, the machine also has 1 built-in monogramming stitching font. It has 170 stitch functions that you can use. This machine will let you take out all your creativity and innovation. No more restricting your ideas and talents! The machine will also prove to be time efficient with its automatic needle threader system. You don’t have to hurt your eyes and waste your time threading the needle anymore. The quick bobbin set-up system is not only a time saver but also ensures smooth and consistent stitching. Furthermore, the machine has a drop feed for free-motion quilting. This allows you to quilt in any way you like freely! Plus, the exclusively efficient feed system lets you work with all kinds of fabric smoothly. Accessories and extra features are often overlooked by many sewers. This is because we do not realize the importance of these accessories. They can come in handy on a number of occasions and emergencies! So what accessories or extra features does the brother HC1850 come with? To begin with, the machine comes with a whole lot of 8 accessory presser feet. These include a quilting foot, zigzag foot, and an overcasting foot. A blind stitch foot is also included in the accessories. You can use these accessory feet for a number of purposes. Create different and unique stitches and looks every time you stitch! Some extra items such as twin needle and ballpoint needle also come along with the machine. There are also 3 bobbins, extra spool pins, and spool caps included. Worried about where you will store these small items? Don’t worry. These items come in an accessory bag that can be used to secure your stitching material safely. As mentioned earlier, there is also an extra detachable wide table included. This makes the machine more adaptable to all kinds of projects. You can sew or quilt on fabrics of all sizes with brightly lit, extra wide workspaces. For better understanding and use of the machine, a bilingual instructional DVD and an operational manual come along. You can take a lot of help from these guides in order to use the machine up to its full potential. Brother has more than just one remarkable and competitive products in the market. 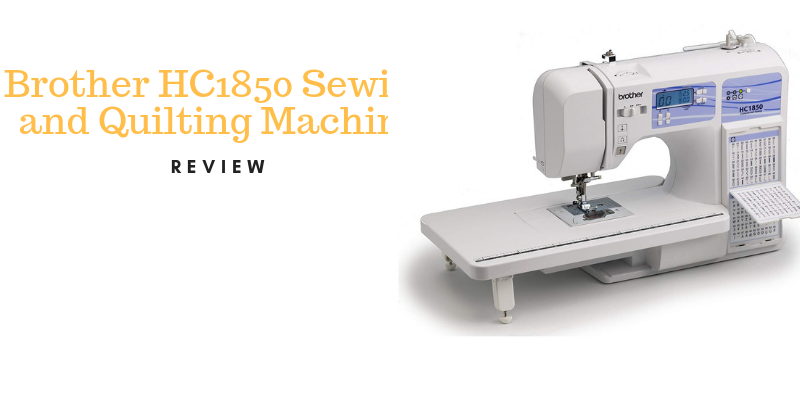 The brother CS6000i sewing and quilting machine is another powerful machine manufactured by Brother. How does the brother HC1850 compare to the CS6000i model? The CS6000i has a very sleek and simple design. It is similar to the HC1850 model in many ways. One of the common features these models have is the extra wide workspace. However, the HC1850 has an optional extendable table that you can remove or attach as you need. The CS6000i lacks this feature. Both the models have an efficient automatic needle threading system that saves a lot of time and effort. 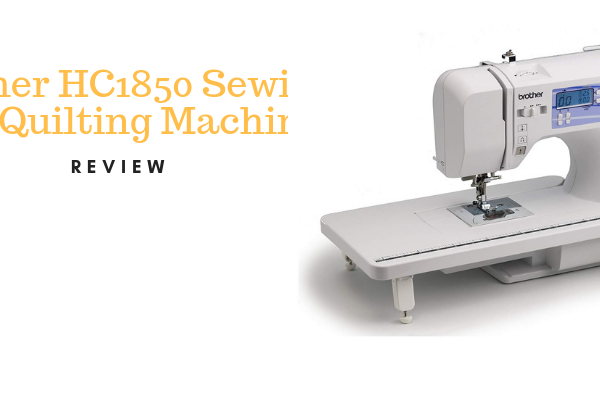 The CS6000i however, is not able to beat the HC1850 in terms of the variety of stitches. The HC1850 has 130 built-in stitches while the CS6000i only has 60. This limits the customization and flexibility of the machine. Both the machines are equally suitable for quilting. Their extra wide workspace also allows different fabrics and large sized projects to be done conveniently. Both the models by Brother come with 8 accessory presser feet. However, one feature that makes the CS6000i outperform HC1850 is its portability. The CS6000i comes with a hard case carry cover. You can safely store the CS6000i in the protective case and even carry it with you. 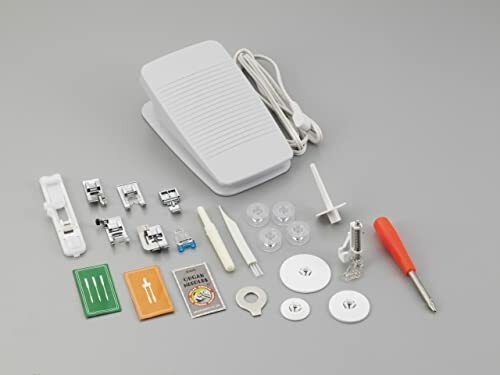 This makes the machine suitable for those who have to attend classes with their sewing machine. The CS6000i also has a free arm with it while the HC1850 lacks this feature. However, the CS6000i has few or no accessory items like the HC1850 does. To conclude, we can agree that both the models do not have huge significant differences in terms of quality. However, the use and flexibility of CS6000i compared to HC1850 seems to be slightly limited. Affordable, considering the number of features. Stitch chart for ease and convenience. 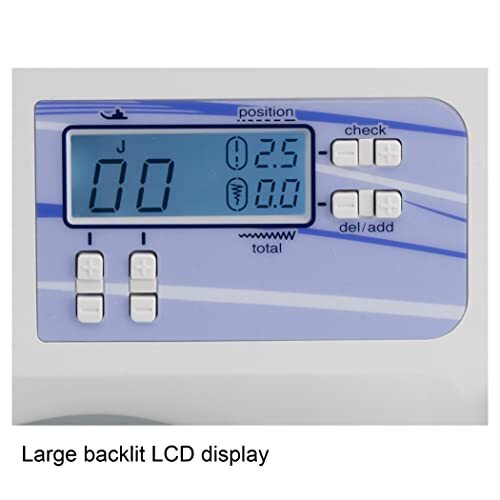 Backlit LCD for easy view. Can be used to work on larger-sized fabrics easily. Reasonable stitch speed of 850 stitches per minute. Good for basic and beginner level monogramming. Lightweight; it can move from its place while working. More suitable for home use. Other products are there in the market that have more versatility. Not usable in countries with power above 120V. Amazon is a great website to buy a product like the Brother HC1850. You will get it at the right price and will be delivered to you in the perfect condition. You’ll also be able to find the HC1850 in local stores, since Brother’s products are quite famous. If you are a beginner who has a limited budget but wants a variety of features, this is the one for you! The machine may be limited in terms of monogramming functions and professional use, but it is the best machine for beginners. It is also best for those experts too who work at home. The final decision depends on your preference and budget after all. The machine has very little portability and is not recommended for people who have to carry their machine. Overall, the brother HC1850 seems to be a reliable investment for beginners and home users.